The urban middle classes hate her, the rural masses love her. The middle classes hate to admit it, but in elections the rural masses matter more. Most of the bhadralok castigate her for ruining university autonomy, filling institutions with her loyalists, and “selling” not just university teaching posts (as the Left Front used to) but even student seats in the best colleges. They say she has brought her own thugs to every district, replacing those of the Left Front. Often, the old thugs have simply switched sides. She is alleged to have created a web of syndicates — monopoly suppliers of various services and construction materials — that skim money from procurement systems. She has financed a plethora of youth clubs, which intellectuals claim are just gangs loyal to Mamata. She is frankly contemptuous of intellectuals, and proudly says she represents the masses. In this, she resembles Lalu Yadav, who in Bihar spent 15 years empowering backward castes at the expense of the upper-caste elite, often by dubious, thuggish means. A very different image of Mamata comes from her supporters, including a minority of the bhadralok. They say she has promoted economic development, and done more for rural roads, rural electrification and water than the Left Front did in decades. In this respect, Mamata resembles Nitish Kumar, who also focused on economic development and was rewarded with three successive state victories. GDP growth seems to have accelerated a bit, but nowhere near as much as in Nitish’s Bihar. In a poor country, all politicians have to show a populist streak, and Mamata is no exception. She has spent much effort promoting cheap health for the masses. She has offered bicycles to schoolgirls, and rice at Rs 2/kilo to ration card holders. Yet this is a very small list of freebies compared with those of politicians in other states like Tamil Nadu. Her main election platform is rural development, not freebies. She defends syndicates and youth clubs as ways of empowering rural people and sharing the benefits of development with a wide range of grassroots folk. She claims thuggery is much reduced compared with Left Front rule. The smell of corruption has hit some of her ministers, yet her personal image is of simplicity and honesty. She has had the guts to stand up to government trade unions that have ousted governments in other states. She pays them dearness allowance amounting to only 75% of basic salary, as against 125% given by the central government. 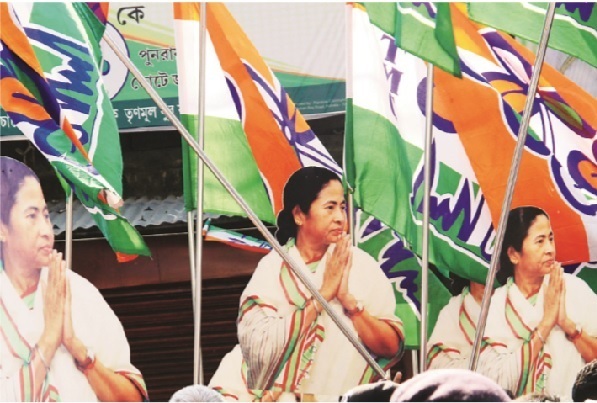 Almost all other CMs have felt obliged to follow the central norm, so Mamata stands out. She has diverted money from civil service salaries to development, and that is both courageous and productive. The Left Front’s land reforms, starting 1977, won it great rural goodwill for decades, but that has now evaporated. The CPM replaced formal government rule largely by cadre rule, and all villages and districts became fiefdoms of CPM cadres. Electricity was perennially in short supply, hitting not just industrial development but rural electrification. Most farmers had to use diesel pump-sets for irrigation, which cost far more to operate than electric pump-sets. Mamata is lucky that, thanks to weak industrialization, the whole eastern grid now has an electricity surplus. Nitish Kumar took advantage of this to extend rural electricity to almost all villages in Bihar, and this spurred his election victory last year. Mamata has also greatly expanded rural electrification, and hopes for a similar electoral dividend. Several chief ministers who have won repeated re-election — Narendra Modi, Nitish, Naveen Patnaik, Shivraj Chouhan — have followed the model of a strong, high centralising CM empowering the bureaucracy to ignore MLAs and panchayat politicians and deliver results (including politically biased ones). Mamata has adopted a milder version of this model. Businessmen like this model, and are surprisingly upbeat on Mamata, even though she came to power — and retains mass rural support — by excoriating the Tatas and other large industries for acquiring land from farmers at cheap rates. West Bengal is doing far better in services and small manufacturing than big industry, and this needs less land. The state’s main crop is paddy. Once, the state was highly deficit in paddy, but the green revolution has created a surplus, lowering the market price below the minimum support price. Mamata has substantially expanded government procurement of paddy, just as Nitish did in Bihar, benefiting farmers. This could be an important vote winner. In sum, Mamata has learned lessons from Lalu Yadav on the importance of dignity for the masses, and from Nitish Kumar, the importance of rural development. I suspect that will give her a big election victory. Narendra Modi didn’t give any freebies for winning election in Gujarat. So, true development will also fetch votes.